Hello again EWA followers! I am following up last month’s blog on Upper Cross Syndrome with Lower Cross Syndrome. This condition really affects those people who sit a lot or do more squatting than the average person. Now it helps if you keep in mind on how the muscular system of our bodies works. Muscles move our bodies buy changing the angle of a particular joint of the skeletal system. So we have; Prime movers-Which are usually bigger muscles that do the most work, Synergist muscles-Which aid the prime movers in movement and Antagonist muscles-Which work against the Prime movers to create controlled movement. So moving back to Lower Cross Syndrome, we are talking about our Lower Back Muscles, Rectus Femoris (the main Quadricep muscle) and Iliopsoas all being tight. 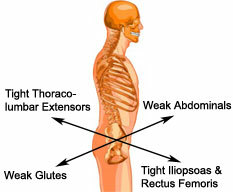 Usually these muscles will become tight from staying in shorten states for long periods of time i.e. sitting at a desk or in a vehicle. While the Glutes and Abdominals (especially the Rectus Abdominis or 6 pack muscle) become weak from being stretched out for long periods of time. When this situation is present it is very important to start loosening the tight muscles through massage and stretching. Then strengthening the weak muscles with strength training. So if you think this syndrome is affecting you come see the massage team here at East Wind Acupuncture for a Postural Analysis and a massage. Thank you all for taking the time to read my blog today. I hope you found it helpful and informative. Balance Be.